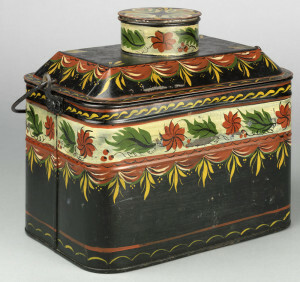 Hand-painted or decorated tinware became less common in households after the Civil War era as the tinned iron industry evolved toward uses like canned foods with printed labels. Historic tinware, however, began garnering attention from folklore scholars and art collectors in the early 1900s. Contemporary artists were inspired by the lively designs. 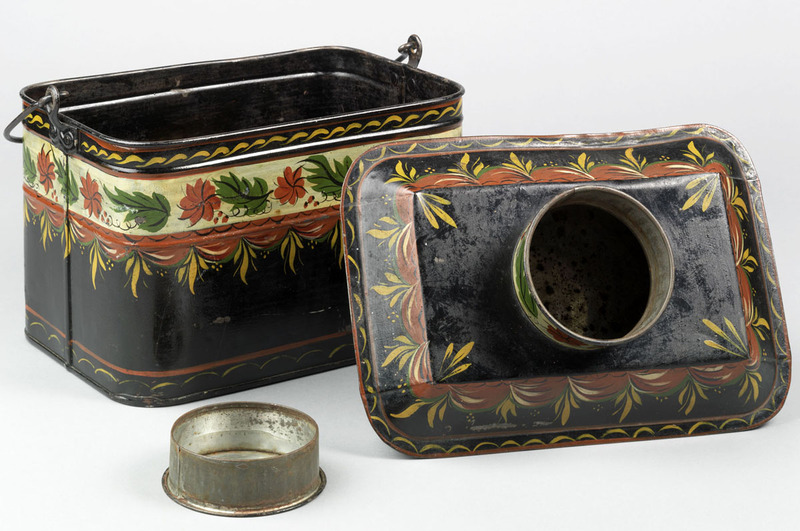 To encourage the study of tinware, new publications highlighted the craft, helped preserve the painted designs, and in some books, even advocated that artists scour and repaint old objects. Today this is not encouraged, but artists can find historic designs in publications and practicing tinsmiths can supply new wares for decoration. The first is a covered pail with a lid that also serves as a canteen with a removable cup. It was made in New York between 1880-1920. Typical lunch pails of this era were not decoratively painted, but they could have a solid color ground paint or varnish. The style of the bands of ornament and even the brush strokes on this lunch pail reveal that it was likely given a new colorful surface during the resurgence of interest in historic tinware after the 1920s. Tea canister, made in the Mid-Atlantic region, 1930-50. A second object, this little tea canister looks quite good overall and the shape suggests it was made in early decades of the 1800s. However, the painted exterior and very shiny tinned interior show almost no signs of age or losses. More troubling, the exterior is entirely coated with a glossy varnish. These signs help indicate a mid-1900s rather than an early 1800s origin for the decoration. In contrast, this tall coffeepot with well-preserved surface was made and signed by a tinsmith continuing the arts of his traditional craft. 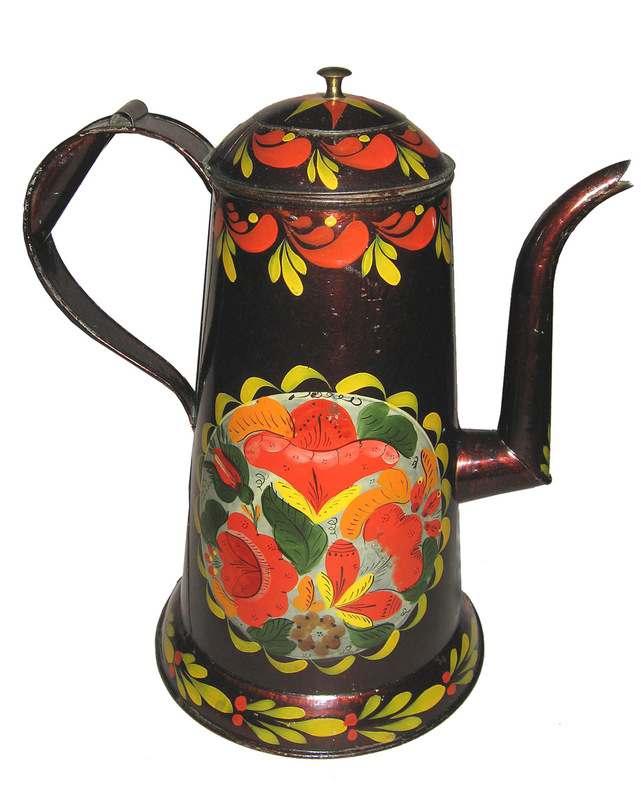 James H. Robbins worked in Philadelphia and he made this coffee pot between 1890-1910. 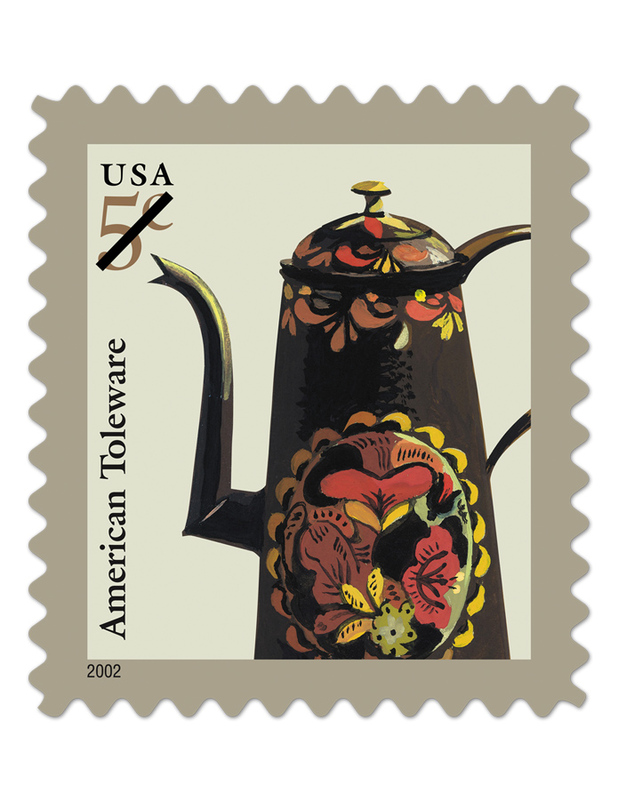 In 2002 his coffee pot served as an artistic model for the United States Postal Service five-cent stamp. 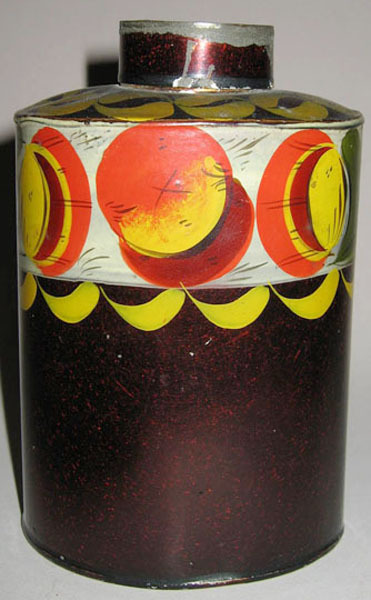 Precision of painted design and sophistication in handling the materials are characteristics of both traditional and modern techniques for “flowering” tinware. Studies of historic tinware in the early twentieth century encouraged new generations of artists to follow the patterns established by previous decorators. American-style “country painting” and European style free-hand bronze painting are equally popular. The last case in this exhibition includes two similar oblong trays, a traditional form made to hold a candle snuffer or quill pen. Both the old and new tray exhibit a tour de force of decorating techniques, including gold leaf and bronze powders to create the shaded fruit and tiny brush strokes to add the details. The modern artist who lent the new tray is a member of the Historical Society of Early American Decoration (HSEAD), founded in the mid-twentieth century to perpetuate and promote hand-painting techniques by studying early American decorative arts. The antique tray, similar to one that inspired her work, is pictured here. Pen tray, made in England, probably Wolverhampton, 1815-30.